The wire shelves found on DisplayMart.com are solid construction, top quality products that are perfect for any showroom. Each of these wire shelves has a universal backing and is compatible with both grid panels and slatwall panels. The choice is yours. 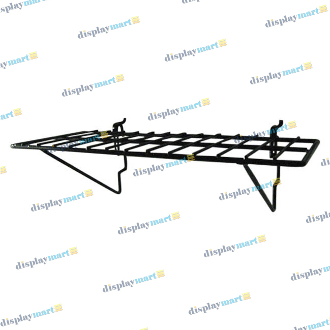 As the shelves are easily added and removed, creating shelving displays for your merchandise has never been easier! Pick your size to display anything from shoes & purses, to videos & DVDs. The shelves come in black or white finishes enhancing, and accenting your displays.